Known behind the desk as “green spots,” pseudomonas is easily treated and simple to explain. Help your client learn to manage greenies so she can avoid an interruption in nail services. Client: It looks like something’s under my nail. You: Oh, yes. I see it. Let me remove the product and check it out. Client: What is it? Is it a fungus? You: No. It’s not a fungus; it’s bacteria. See where the nail is cracked/lifted here? That’s how it got in. Did you glue this crack/lift? Client: Yes (see answer 1); No (see answer 2). You: (Answer 1) OK. In the future, call me to fix it instead. When a nail cracks or lifts, bacteria and water work their way through that crack and get trapped on the nail; it’s a perfect environment for bacteria to grow. You: (Answer 2) OK, good. Sometimes clients are tempted to do that, and it’s never a good idea. Next time you see a lift or a crack, give me a call; I’ll fix your nail so this won’t happen again. Client: Whatever you do, don’t take off my nails! You: Right now, I’m going to remove the product and make sure all the bacteria are removed. Then I need to make sure your nail plate isn’t “soft” from moisture. If it is, I won’t be able to reapply an enhancement until the nail has hardened. You: (Answer 1) OK, I’m actually going to wait a couple of days to reapply this nail. The nail itself is still soft from moisture. Come back in a couple of days, and I’ll reapply it. You: (Answer 2) OK, it looks good! I’ll sanitize it one more time to prep it for the enhancement and you should be good to go. We might see some discoloration until it grows out, but the bacteria are dead. Do you want to choose a polish to hide that stain? According to Doug Schoon, president of Schoon Scientific, the vast majority of infections that occur on nails with no signs of lifting are caused by the nail tech. For example, if a client touches her nails to her face and the nail plates aren’t re-cleaned the chances of an infection go up tremendously. 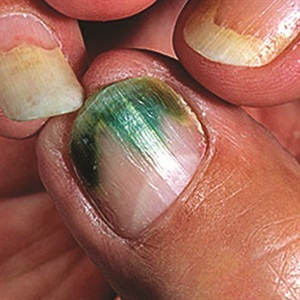 If the nail is cracked or lifted and you see a green spot, you can assume it happened outside the salon. If you can’t find a point of entry, learn from the experience by taking extra precaution to keep the nail plate clean before applying product. If you see any redness, swelling or pain, do not apply another enhancement until the area is healed.